Save a few sheets of paper and spark your creativity at work with the laminate Whiteboard Desktop by UPLIFT Desk. Enjoy having a temporary home for all of your ideas, sketches, and To-Do lists, right on your desktop. You and your team can quickly jot down the key takeaways from meetings without having to pause to open a new document. Mental notes are easier to keep track of with a desktop that lets you mark it up and erase it when you're ready for a clean slate. 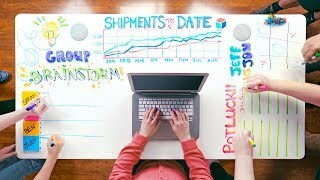 Use with classic dry erase markers and a whiteboard eraser to give yourself a neverending canvas for your creativity. These desktops are GREENGUARD-Certified, so you know you're tasking at a safe and eco-friendly desktop that boosts your creativity to new peaks while you take your desk to comfortable heights. The Whiteboard Desktop by UPLIFT Desk is available in many sizes to fit a wide range of needs, from your personal office space to a conference room setting. Each desktop is 30" deep with widths from 48" up to 80" wide. Each rectangular desktop has 30mm rounded edges, like our other laminate desktops.